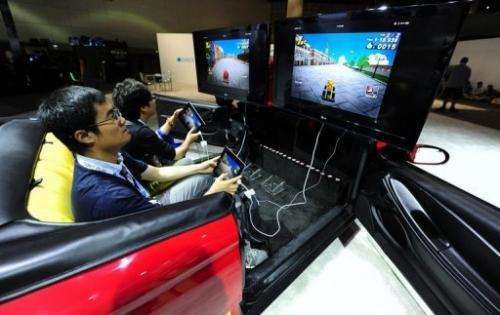 Gamers sit in a car while playing Wacky Motors in a videogame extravaganza in Los Angeles on June 7, 2012 in California. More than seven in 10 Americans who play videogames are now doing so online, a survey showed Thursday. The NPD Group study showed the figure of 72 percent of online gamers was up five percentage points from a year earlier. Along with the rise in online gaming, there was also an increase in the number of hours spent playing games across various devices. The rise was nine percent overall and six percent for online games. "Besides the size of the gaming audience and sales performance, one of the key metrics for the industry to watch is the time gamers spend playing games," said Liam Callahan, an NPD industry analyst. "This study found that the overall amount of time spent gaming, and time spent gaming online increased across virtually every type of device, and notably so, versus 2012." The PC ranked as the top platform for online gaming, with 68 percent using that device. But PC gaming use was down four percent and online gaming on mobile devices grew by 12 percentage points since last year. A total of 62 percent of those surveyed said they preferred games in the physical format, down three percent from a year earlier. "While many gamers prefer games in the physical format, the increased availability of digital content paired with a greater amount of connected devices has driven an increase in the number of consumers going online to access the content they want," said Callahan. NPD surveyed 8,867 individuals in an online survey between February 15 and March 4. The statement that "more gamers are moving online" added to the statement "62% of gamers still prefer a physical copy" says only one thing. That gamers are moving online because they have no choice. If you force gamers to log in to a server by making it impossible to play the game otherwise, you don't get to crow about how online gaming is a viable trend and the wave of the future. I agree. dota 2 is awesome.